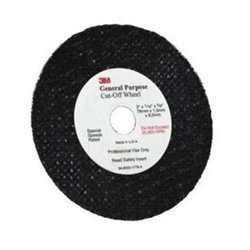 3M General Purpose Cut-Off Wheel, 1988, 3 in x 1/16 in x 3/8 in BOWES 3M 01988. Used for cutting autobody sheet metal, frame rails, exhaust pipes, clamps and rusted bolts. For use on utility type cut-off tools. DO NOT USE TOOLS WITHOUT GUARDS.